Have been in Columbus since coming to OSU in 78. After a 21 year stint with CompuServe/WorldCom/MCI/Verizon, I was downsized in 2010. Began working at The Ohio State University in 2011 and love it. I do billing compliance for 20+ physicians at the student health center. Love being back on campus and helping students. The campus and focus of OSU has changed over the years but I love it. Still running marathons after 20 years. 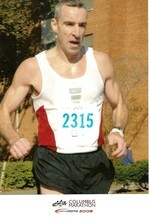 Training this summer to qualify for Boston again. Great to see all the profiles and look forward to seeing more! Mike Bower has a birthday today. My younger sister Jan and me after a marathon in 2005. Something besides a running photo!